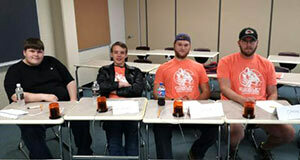 The Cowley College Academic Excellence Challenge teams dominated its fall scrimmage at the tournament held at Neosho County Community College on Saturday, November 5. The Cowley “A” team made up of Daltin Brock, Chase LaPorte, Jesse McCabe, and Garrett Misora went 4-0 at the tournament and placed first out of seven teams. The Cowley “B” team consisting of individual tournament champion Harvey Baker, Ashley Simpson, Aimee Schwintz, and Symantha Shelton went 3-1 and placed third. 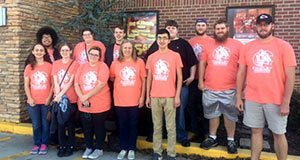 While, the Cowley “C” team of Dana Risley, Christian Simmons, and Edgar Fuentes finished seventh. Neosho, Coffeyville, and Allen made up the other schools at the tournament. Daltin Brock, Chase LaPorte, Garrett Misora, and Chris Simmons placed fifth through eighth, respectively as Cowley had five of the top eight finishers at the tournament. The team is coached by Dianne and Mark Flickinger and has nine of the 11 team members involved in the TriO/IMPACT program. The AEC Cowley “A” team has been to Nationals the last two years and according to Dianne Flickinger the goal this year is to qualify two teams for Nationals and take first place in the Kansas AEC Tournament.